I've often thought that a weighted blanket would allow me to get to sleep faster. I have to reach a certain warmth factor before my eyes will even shut. From what I have heard they also tend to make you or your children feel more secure. 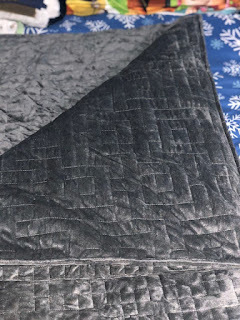 In the last few years, weighted blankets have become increasingly more popular. Katrina at Top Notch Material just did a review of one from My Calm Blanket. Go see what her and her daughter thought. 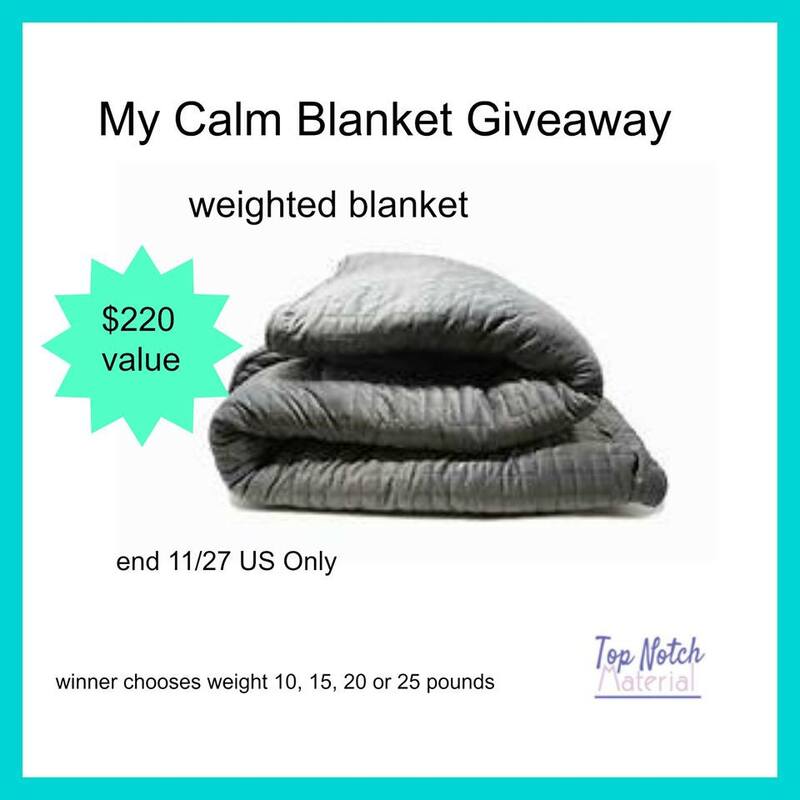 Please follow the Giveaway Tools below for your chance at winning a blanket of your own. The winner gets to choose which weight they want from 15-25 pounts. Recently I have heard of weighted blankets but havě not tried them. Not sure of amount of weight but medium or moderate may be good. I have never tried this blanket before. However, it was recently recommended to me by my daughter's teacher that it can help with her anxiety. These blankets can be helpful with children who have autism and ADD too. I would love this for my daughter. I have never tried one of these but I do have it on my wish list. I am not positive as to the amount of weight but probably in the 15-20 pound range as I would like to be able to use it with my little one as well. I have never tried these blankets. I think I would like the 20lb one. We haven't used one yet, but would like one for my daughter with autism. I think maybe 20 lbs. I have a small weighted blanket that I've used during panic attacks, flashbacks, and just general anxiousness. It really helps! Just wish it was bigger so I dont need to be curled up when I'm laying under it. Sacrificing my body's comfort for my minds almost isn't worth it sometimes. The one I have now is about 10 lbs but I feel like it would be better if it were a little heavier. It is at the very top of my wishlist and have been scouring the internet for one that I could possibly afford. I have fibromyalgia and am in constant pain which seems to get worse when trying to sleep and overtired. I dream about a weighted blanket as I know that weight does help when I place it over my legs. A blanket though would help me immensely. Thank you so very much for the chance. I would like a 15 lb blanket. Our daughter recently purchased a weighted blanket and loves it. She says she sleeps better and feels rested in the morning. I would like a weighted blanket in the 15-20 lb. range. No, I have never tried a weighted blanket before so I am really unsure about the weight range I would need. I love them. About 18 lbs is probably good for me. I like a good safe blanket. I've never tried one before, but I've done my research and I've no doubt it'll work for me. I'd get the 25lb weight. I would pick between 18 or 25 lbs. I'd be interested to see if it would help me sleep better.